How much does a PODS container cost? How much do PODS usually cost? How do you pack a POD? PODS pricing depends on several different factors specific to your moving situation. Rates can start as low as $149.99 per month for the smallest size. Naturally, the price goes up for larger containers, and you'll also pay a monthly usage rate with long distance moves. Additional fees may apply for size availability, geographical location, and duration of storage. Learn about what they are and what PODS offers before picking the right one for your budget. 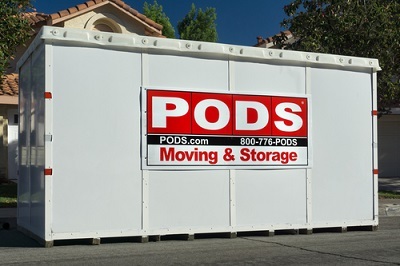 For local moves, the average cost to use PODS is $640. For long distance moves, the average base rate is $3,263. How does PODS calculate their price? What exactly is PODS? Many of you have heard the term thrown around, but what does it mean? PODS is a moving company that conveniently delivers storage containers to your home. Unlike truck rentals, you are only renting the storage unit itself. You pack it, and the company drives the entire container from Point A to Point B. They can transport it to your new home or stash it in a warehouse until you're ready for it. PODS is convenient and cheaper. PODS accommodates your timeline rather than the mover's. PODS presents you with a cheaper option than a full-service move. PODS offers a safe space for large items like furniture and appliances while you get your new home ready. Park the PODS container in your own driveway if you don't feel comfortable keeping your large-ticket items in storage. Level loading means your items will never be tilted on an angle. Safety is priority, and there are no ramps on the units. Drop off and pick up on whatever dates you specify. PODS drivers are certified to move your unit, so you don't have to. Are all PODS the same? 7-foot containers measure 7' x 7' x 8' and is the most popular option. This size works best for a single room of furniture, like an apartment, and is equivalent to a 10' box truck. 12-foot containers measure 12' x 8' x 8' and are only available for in-town moves/storage. This size works best for 2-3 rooms of furniture and is equivalent to a 15' box truck. 16-foot containers measure 16' x 8' x 8' and is the largest option available. This size works best for 3-4 rooms of furniture and is equivalent to a 20' box truck. The containers are steel-framed and weather-resistant. You supply the lock, so no one can enter the unit without your permission. If you aren't comfortable with it out of your sight, leave the PODS on your property for maximum security. The company equips every container with tie-downs, steel locking latches and ramp-free loading. PODS are the most-trusted and well-known names in the container moving industry. They have been around for almost 2 decades with over 3 million moves under their belt. Contents Protection: When you place your PODS order, you'll have the opportunity to purchase protection. You'll be able to choose a level of coverage based on the declared value of the container's contents. It's important to note that any items prohibited in the rental agreement will not be covered. Container Only: The Container Only option can be purchased to supplement your Contents Protection, and in some cases, comes as part of your quote. While you have the PODS container in your care, you are responsible for any damage or loss of the unit. Container Only coverage does not include anything inside the storage unit itself. Need help packing your PODS? If you need help packing, don't hesitate to check out some of our helpful and incredibly informative packing videos or visit our moving guides page for tricks and hacks to utilize during the moving process. And if you're thinking about hiring some professionals to pack for you, head over to our moving labor page for free quotes from local moving labor companies. A HOT TUBE.MOVE FROM GARAGE TO BACK YARD..
How can check the moving company license? Do moving companies have to show their physical address on paperwork? How to pack in a fast way to move?